A light green China tea scented with jasmine. 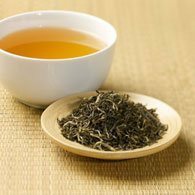 This green tea has been a favourite in China since the days of the Song dynasty, eight centuries ago. The best quality comes from Fujian Province where Flowery Orange Pekoe leaf tea is mixed with freshly opened jasmine flowers, and left overnight to allow the tea to absorb the scent of jasmine. The flavour is light and sweet with a subtle perfume. Use a warmed teapot and add one teaspoon of tea per person and an extra ‘one for the pot’. Add water just under the boil and infuse for 2-3 minutes. Serve on its own. You can top the teapot up with more hot water as you enjoy the tea.